It’s hard to believe, but the regular basketball season comes to a close this week and the postseason is set to start on Saturday, Feb. 16. The People’s Tribune and TribCast will be following action at the Class 3 District 8 tournament at Montgomery County High School where Bowling Green teams will be competing, and Class 2 District 5 at Elsberry High School where Clopton, Louisiana, Silex and Van-Far teams will be competing. The Bowling Green Lady Cats will get things going in the opening round of the Class 3 District 8 tournament on Saturday, Feb. 16. The Lady Cats are seeded third and will face (6) Christian at 5 p.m., the final game of the day. If Bowling Green wins, they will advance to the semifinal on Tuesday, Feb. 19 where they will take on the winner of the (2) Hermann and (7) Wright City opening round game. The semifinal will be at 7:30 p.m. If the Lady Cats win they will advance to the championship game which is slated for Friday, Feb. 22 at 5:30 p.m. Lutheran St. Charles is the top seed in the tournament and has an opening round bye. Coach Craig Smith said he was not surprised by the seeding and noted the season has been a learning experience for everyone. Winfield in the opening round at 7:30 p.m. If they win, the Bobcats will face the winner of the (2) Hermann and (7) Wright City opening round game in the semifinal on Wednesday, Feb. 20 at 7:30 p.m. The championship game is slated for Friday, Feb. 22 at 7:45 p.m.
Coach Brandon McCann said the season has gone as he had expected and was not surprised by the number three seed in the district tournament. District games will be featured live and archived on TribCast – online at www.thepeoplestribune.com. Action in the Class 2 District 5 tournament will begin with the girl’s bracket on Saturday, Feb. 16. The Clopton Lady Hawks secured the top seed in the tournament and will square off with the (8) Louisiana Lady Bulldogs at 1:30 p.m. The winning team will advance to the semifinal to take on the winner of the (4) Van-Far and (5) Mark Twain opening round game on Tuesday, Feb. 19 at 5:30 p.m.
Clopton Coach Deaven Streed said she is happy with how the team has performed all season, noting the team has faced a number of tough teams, some on multiple occassions. Streed added the season did what it was designed to do in preparing the Lady Hawks for the postseason. “Although we are very happy with our current record and standings, we know that the end result is really the most important part. We have a pretty competitive district with teams like Van-Far, Mark Twain, Elsberry, and a very good Paris team. It will take grit and determination to survive and advance – as it should. We are a senior-led team so we are relying on their leadership and drive to help determine our success down the stretch. I’m very anxious to see how our girls perform and have very high expectations,” Streed concluded. Louisiana Coach Derrick Branstetter pointed out the district is extremely top-heavy this year with Clopton and Paris as clear favorites and Elsberry playing well and may be a surprise winner. The Van-Far Lady Indians are seeded fourth in the Class 2 District 5 tournament and will kick off the opening round against (5) Mark Twain on Saturday at noon (the first game of the day). The winner will take on either (1) Clopton or (8) Louisiana in the semifinal on Tuesday, Feb. 19 in the semifinal at 5:30 p.m.
Coach Kelly Borchert pointed out the team is very young this season and is led by two seniors so a lot has been asked of younger firls this year. The Silex Lady Owls are seeded seventh in the Class 2 District 5 tournament and will take on (2) Paris in the opening round on Saturday at 3 p.m. If Silex wins, they will advance to face the winner of the (3) Elsberry and (6) New Haven opening round game in the semifinal on Tuesday, Feb. 19 at 7 p.m. The girl’s district championship game is slated to take place on Friday, Feb. 22 at 5:30 p.m. The boy’s bracket will begin action in the Class 2 District 5 tournament on Monday, Feb. 18. The returning district and state champion Van-Far Indians drew the top seed in the tournament and will take on (8) Louisiana in the opening round at 5 p.m. The winning team will advance to see the victor of the (4) Mark Twain and (5) Paris opening round game in the semifinal on Wednesday, Feb. 20 at 5:30 p.m.
Coach Pat Connaway said the season has been another solid one for the Indians and that the team is starting to play some of their best basketball at just the right time. Connaway said the team is going to enter the tournament knowing the season could end on any given night, but will have the mindset of trying to play seven more games. Louisiana Coach Matt Smith pointed out that starting the district against Van-Far is tough as they have played them three times already this season and have been handled each time. 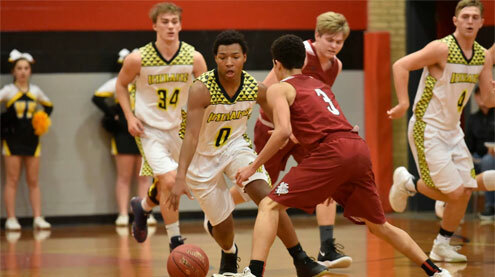 The Clopton Hawks are seeded sixth in the Class 2 District 5 tournament and will face the host school (3) Elsberry in the opening round at 8 p.m. on Monday, Feb.18. If Clopton wins they will take on the winner of the opening round game between (2) New Haven and (7) Silex in the semifinal on Wednesday, Feb. 20 at 7 p.m.
Coach Tony Francis said the team is excited for postseason play but they are aware that facing a host school will be a challenge in and of itself. Francis added that while the win column for the regular season may not show it, the team has made great strides in areas the average fan can’t see. “The laying of a foundation is difficult and is far from glamorous. These men have showed up everyday and have been willing to accept the many challenges I have thrown at them. Regardless what happens the remainder of this season, I am proud of their ‘buy-in’ to this new culture and am excited to see them reap the rewards of their hard-work in the years to come,” Francis concluded. The Silex Owls are seeded seventh in the Class 2 District 5 tournament and will take on (2) New Haven in the opening round on Monday at 6:30 p.m. If the Owls win they will face the winner of the (3) Elsberry and (6) Clopton opening round game in the semifinal on Wednesday, Feb. 20 at 7 p.m.
Coach Aaron Henke pointed out the team has improved a lot over the course of the season and has had some success. The boy’s championship game is slated to take lace on Friday, Feb. 22 at 7 p.m.
District games will be featured live and archived on TribCast.